The main protagonist of A Tofu Tail. A woodsman tricked by a mysterious woman and transformed into a cube of tofu whilst wandering through a wooded strath. Mr. Tofu has always been yearning for more fortune than he currently had. Like most, thinks that he can take power and wealth at no perceived cost. This, as with many others, will lead to his downfall unless he can learn to accept what he has, and enjoy the company of those left around him. Maybe time and his experiences will allow Mr. Tofu to accept his path and enjoy the amazing people and places that he has the opportunity to see! 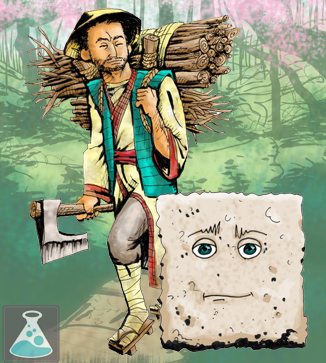 As a tofu-man, Mr. Tofu is able to traverse various environments and magical elements without harm. He has taken on a portion of the power of the Kitsune to draw power from their individual elements in the surrounding environments. But like tofu, he has also been able to learn to absorb the properties of the world around him (i.e. the elemental orbs of the Kitsune Realms) to expand this skills! Mystery awaits him as he traverses unusual and surreal worlds in search of the his true form and the creature responsible for his misfortune. Can ﻿absorb﻿ properties of objects in contact with his body; Has the ability to store many objects within his body.